My sockpal is Amy. Amy, I am such a loser sockpal..I'm shipping off your package today..actually, today is still Sunday, I'll ship them off Monday. It took me forever to decide on a pattern for you..I tried three different times, and finally, sitting in a hotel room in Rochester, MN--it came to me...Cascade Socks from Fiber Trends. 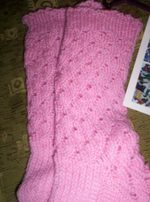 It's a Walking Away Sock pattern, and look..no pooling! I really wanted to use this Lorna's Lace's yarn for your socks, and luckily a pattern finally came to me. WOW!! I was the sockpal for Jennifer..and when I came home from my first week away, her package arrived all the way from Spain..I didn't have a chance to open it after my second week away, just this Tuesday. The socks are lovely, Jennifer..in pink of course, which is one of my favorite colors, and it's the Child Sock pattern from Nancy Bush's Vintage Sock book...this is soooo eerie, because 1) I have the exact Opal sock yarn in my stash, and 2) I have this pattern on the needles, somewhere in my house. I'm really impressed you finished the pair..I'm stuck on trying to memorize the chart. 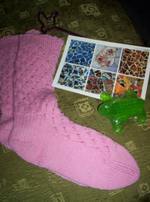 Other goodies included were a lovely postcard--and yes, it does inspire intarsia, a cool pen and a green froggie soap. I love green and frogs--how'd you know that?? Thank you so much! I am truly appreciative for such a cool pair of socks and the extra presents too.. I was just thinking about you last night. I was wondering how your road trip had gone, because we had just returned from a little trip to Omaha (woo hoo). Can't wait to see you next Tuesday! We haven't forgotten about you, silly. I was afraid you'd forgotten about us! The socks look great, and what a wonderful package from your sock pal. I really need to knit up some socks. Of course we haven't forgotten about you! I was thinking of emailing you to see if all was well. I'm glad it is! What fun socks from your sockpal, and lovely socks for your sockpal. I'm sure she will forgive you. :) Glad you received and enjoy the markers! Oh my, those look wonderful. And they are for me! What fun to see these on the screen and know they are headed my way! They came in today's mail! Thanks so much, Renada--they are really lovely (love the patterning on the back), and fit me nicely. And wow--what great bribes! I've always wanted to try the Bearfoot yarn, and now's my chance!